When I think of respect, I think of consideration, tolerance, courtesy, understanding, humanity, dignity. 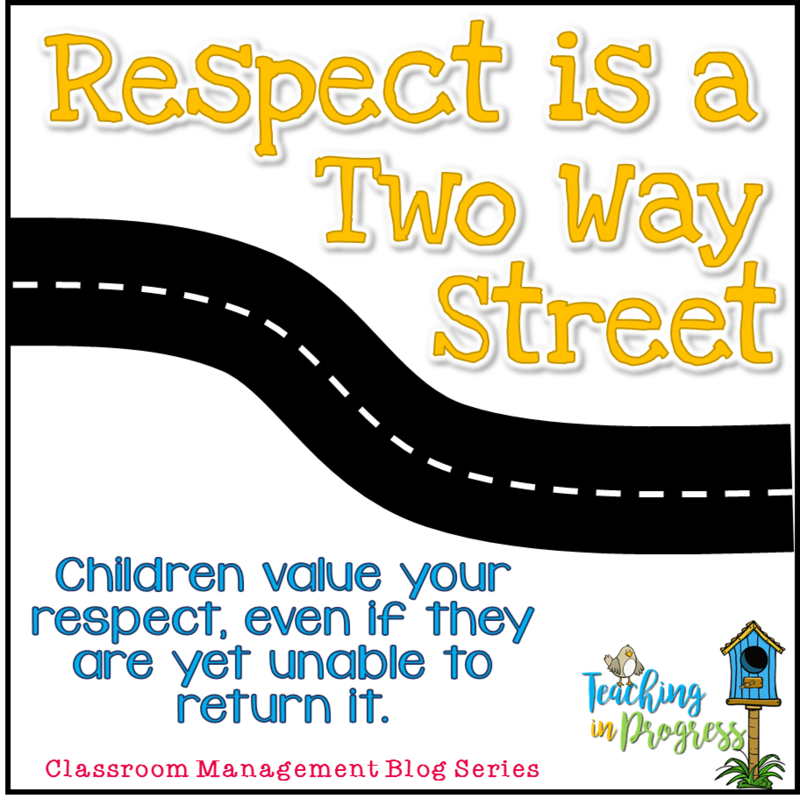 Respect is essential to maintaining a productive classroom, but I think we so often make assumptions about what kids know and understand about the meaning of respect. Classroom respect isn't only about kids respecting teachers. Of course we want our students to respect us, but we can’t forget that it’s a two way street. We have to give it to get it. Just like with love, my respect for my students must be consistent and honest. A respectful classroom means keeping personal matters such as discipline and academic progress, private. This is why I do not have a behavior chart, or class dojo, or a bulletin board showing who knows their math facts. Not to say we don’t celebrate successes and discuss difficulties as a whole group, we do! But keeping private things private helps to maintain a child’s dignity. I truly believe that preserving a child’s dignity is essential to developing a caring culture of mutual respect. A respectful classroom environment does not tally up every right or wrong move a kid makes. I don’t want my principal to do that to me! I want him to come chat with me if I screw up. In private. And come up with a solution for avoiding another screw up. I want him to compliment me when I have done a good job. But I do not work hard to be good at my job just so I can collect a bunch of compliments from administration. I work hard because I like my job and I want to do well. While I agree that kids need frequent positive reinforcement, I caution teachers to be careful how it’s given. If it’s clipped or punched or counted, it can become a means to an end as opposed to a way to meaningfully integrate positive behaviors. I want kids to respect me, their peers, and our school space because they WANT to, not because they are avoiding a color change or attempting to earn a reward. So to get that from students, I must value their contribution and their opinions. I must model how to treat others in the way that I treat students and staff. It means I honor my promises to them. It means that I leave my snarky sarcasm in the teacher's lounge. I treat them the way I want teachers to treat my own boys. Children are perceptive little creatures - they know which teachers truly respect them. They value that respect, even if they are yet unable to return it. FINALLY someone said how damaging those clip charts are! My 5 year old HATES the color blue now because of it! I am sorry he has had such an experience:( I am doing my best to spread the word about how damaging they can be! Super post. I totally agree. I love how you likened what goes on in the classroom to your own adult life. That's the way I like to think about my classroom choices too. Wonderfully said! Noooo! You're making me rethink everything about my clip chart and classroom coupon book too close to school starting! I read your previous post about not liking the clip chart but I wasn't completely convinced. It was this post and how you related it to the relationship between teacher/administration that changed my mind. So now that I'm super confused-I need more details, like now because teacher work work is Monday! :) I too am one who practices procedures when others have stopped after the first week. I am known to be good with classroom management to the point where there are days that I forget all about the clip chart. BUT, I feel like I need something. You simply use verbal corrections and the thinking space? Do you keep parents informed about class behavior? If so, how? I do not keep parents informed about daily behavior. I tell parents that we are like a little family each day and we handle all our problems in house and move on. If a problem is pervasive, I will call parents so we can work on a plan to help the kid make some positive changes. I try to make a call to every parent about once a month just to say hello, touch base, give a compliment, etc. Hi! Thank you so much for such a thoughtful post! I felt these things in my heart even before I became a teacher and have been met with some push back at my refusal to implement color charts and treasure boxes. When you're able to get that safe family feeling and kids know that mistakes are part of life and that we can fix it together, it is such a lovely, warm feeling.